“It was the night before Christmas. Well to be more precise, it was the afternoon before Christmas. But before I take you into the beating heart of the action, let’s get one thing out of the way. I know from experience that if it comes up later, it will distract you so much that you won’t be able to concentrate on anything else I tell you. My name is Jubilee Dougal. Take a moment and let it sink in. It starts with a girl, and a train ride, during the biggest storm in fifty years, and all of a sudden you have more girls, some guys and a whole host of cheerleaders. This book contains three stories, all intertwined, all taking place over one manic Christmas. When Jubilee Dougal steps off a stranded train in Gracetown she doesn’t expect to find anything other than the blissful heat of the Waffle House she wants to shelter in. But she finds much, much more, and with it she sets off a series of life-changing events. When its a week before Christmas, the weather is freezing and you want to take your mind off the fact that your money has run out but you still have presents to buy and a party to go to, you want a great Christmas story, and thankfully this book has not one, not two, but three great Christmas stories all begging to be read! The stories were brilliant, but on their own they would be just ok. They were made better by the fact that they intertwined and things that happened in one really did impact the things that happened in the others. I loved that little snippets mentioned meant something later on and made you remember the earlier events and that you get to know the background of so many of the characters involved. These are soppy romances and to be honest they are kinda predictable, but in the best way. There was a bit of insta-love going on but I can ignore it for the festive cheer! The characters were interesting, in that I don’t think you are meant to like them all that much. They all have a learning curve to go through in the book and I really liked how much they learnt about themselves just in the story they were the focus of. Jubilee had to reflect on her life and how she was just kinda a passenger in it and that made me sad because none deserves that… however that was perhaps exaggerated by the extent of Addie and how self-absorbed she was. I really disliked Addie in certain parts of her story even though the stuff that was happening to her wasn’t necessarily her fault, but come one… some things are just not a good idea! The authors obviously collaborated a lot and that shows in how well the stories go together and how the writing flows all the way through. You can tell the stories are written by different people but not in a bad way at all. I think I did prefer the Maureen Johnson story to the others because it was better all round, it had better characters and the narrative voice was just brilliant, I loved Jubilees attitude, plus the story itself was the perfect set up to the others but the blatant insta-love put me off a little. John Green’s was a little too predictable and there were some bits particularly about The Duke that I wasn’t too keen one which surprised me coming from him…. but I think they may have been there to make a point. Lauren Myracle’s The Patron Saint of Pigs was brilliant but the dislike of the narrator put me off a bit and I didn’t like all of the end, there were some parts I enjoyed but others I thought could be better. All in all this was a really good book and I would definitely recommend this one to anyone looking for the perfect book to curl up in front of the fire to and hope its on your kindle or bookshelf to read this Christmas. 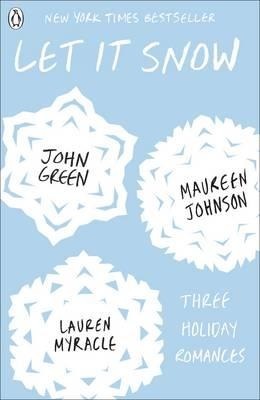 Let it Snow was published on September 5th by Penguin UK. My copy was sent by the publisher in exchange for an honest review.